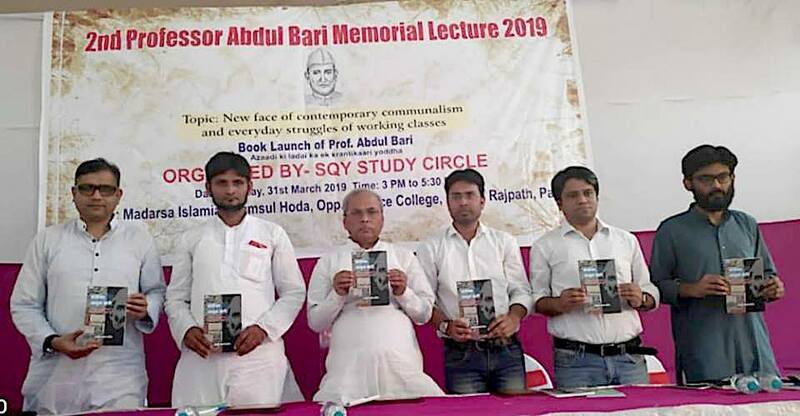 Patna: BeyondHeadlines editor Afroz Alam Sahil has penned down a book on Professor Abdul Bari, a forgotten personality who played an important role in the freedom struggle of India. The author is well known for his research on Champaran movement and those makers of modern India whose names are missing from the pages of history. The Hindi book titled, ‘Professor Abdul Bari: Azaadi ki Ladaai ka ek Krantikaari Yodhha’ (Professor Abdul Bari: A revolutionary Warrior of the Freedom Struggle) contains 100 pages with 156 references. The research book has been compiled after consulting more than 100 book, papers and other sources. The book also contains the details about the role played by Professor Bari in the independence movement. “Writing history is a tough task, on that writing a book on the history of a Professor of history who did not just learn and taught history but himself had created history, becomes even more tougher”, says Afroz Alam Sahil, the author of the book. The readers will know after reading the book that he was one of the most important personalities of Indian National Congress who did not shy away from criticising his own party when he found any faults in it, a quality which we hardly see in any political leader of current times. “It is disheartening that his contribution is not at all discussed. This injustice has continued with all the heroes and revolutionaries who sacrificed their lives for the betterment of society”, adds Sahil. The book was launched on Sunday, March 31 in Patna by Prem Kumar Mani (ex MLC). Hilal Ahmad (Associate Professor, CSDS), Saquib Salim (Historian and Commentator), Sharjeel Imam (PhD Scholar, History, JNU), were the speakers at the event. The launch programme was held at Madarsa Shamsul Hoda Auditorium and organised by SQY Study Circle. Md Umar Ashraf, Intekhab Alam and Khurram Mallick were among the chief organisers. The book is due for another release in Delhi in the coming month of April. Saquib Salim talked about the unique historical role played by Abdul Bari as a labour leader from a Muslim community. Hilal Ahmad discussed the difference between current and older forms of communalism and the role of neoliberalism in this development. He emphasised the importance of the personality of Prof Abdul Bari in the current context. Sharjeel Imam discussed the violent death of Abdul Bari and the narratives that emerged from this unexpected murder of Bihar Congress President. He also discussed the various shades of communalism, and the need for Muslims to organise and seek rights for the community. Prem Kumar Mani, who presided over the meeting, discussed the life and contribution of Prof Bari, and encouraged the audience to organise more programs, and write more exhaustive books on Prof Abdul Bari and other forgotten heroes. “The book is an attempt at bringing back his identity not just as a leader of a labour movement but a prominent leader of the freedom movement of India,” said the author.